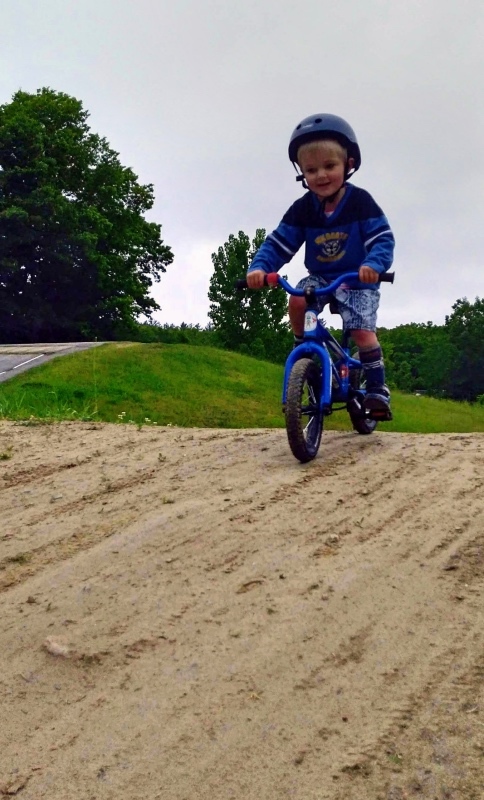 Last fall, on a whim I suggested that we visit a local BMX track in Wakefield, MA (map). Even on a push bike, my youngest had a blast and my older son was a lot more courageous than I would have expected. 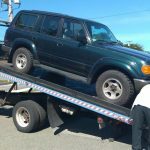 We went back several times, but after we blew the motor in our old Land Cruiser on the way home, the boys didn’t want to go back (they were a little traumatized) for fear that our 4Runner might die if we go back. Winter was setting in anyway, so I let it go. 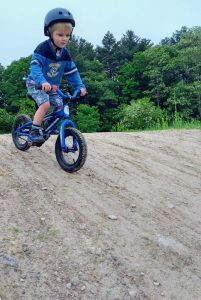 This spring, I did some more internet searching and found another BMX track in Billerica, MA (map). It is a big bigger and more well-maintained than I remember Wakefield being, but also quiet on an early Saturday morning — we all had a great time! After visiting a few more times we went on a Sunday to watch the racing and the boys were enthralled. A woman named Donna approached us on the hill, welcoming us to the track, and asked if we had any questions. Seeing their interest and enthusiasm and wanting to foster it as much as possible, I asked What do they need to race? Donna replied. Thus began our search for bikes with hand brakes. I looked into adding hand brakes to the 12″ and 14″ bikes they already rode, but the retrofit looked to be about $50 minimum. 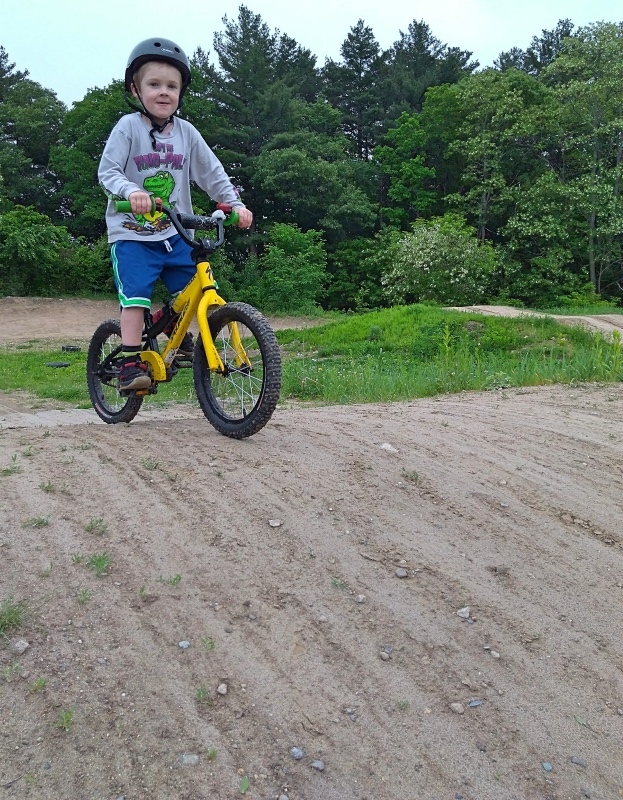 Watching the young 4-6 year olds ride their bikes around the track with such ease also made me want to just upgrade bikes to something more purpose-built. Sizing was then my next question. Here is the most exhaustive dialog about sizing that I found, but I still felt clueless about what size to get my little guys who are 40″ and 44″ tall. Then I found this PDF buried on the Redline Bikes website. Cool —I needed two micro minis. Boston craigslist turned up nothing, so I expanded my search radius using searchtempest.com. If you haven’t used that site before, think of it as a way to search a bunch of city’s craigslist ads simultaneously. I found one listing for a Redline Micro Mini in York, Maine, so last Saturday we took a roadtrip up there and bought it for $175. That said, I’d never been able to touch one before, and this one seemed larger than I expected. Strangely, it also had 20″ wheels on it, and I thought micro mini’s had 18″ wheels (which makes them hard to buy tires for). I briefly questioned the owner about this who insisted even though it said ‘mini’ on the top tube that it in fact was a micro mini, so I let the issue rest. 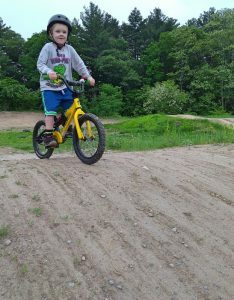 The bike was in great shape, and seemed to sort of fit my older son, so one bike down and one to go. Sunday we went to Billerica to the Massachusetts State Race. Now I’m not sure what ‘state race’ even means, but I do know the place was PACKED with riders. As I’d learned from the FaceBook groups and forums, these big races were clearinghouses for people looking to sell gear. We quickly found a Redline Micro Mini in great shape for $280. I also picked up 2 kid-sized HJC helmets that had surely hit the ground a few times, and would likely hit the ground several more times in the future. I know all this cash outlay seems extreme, and it is given my income. 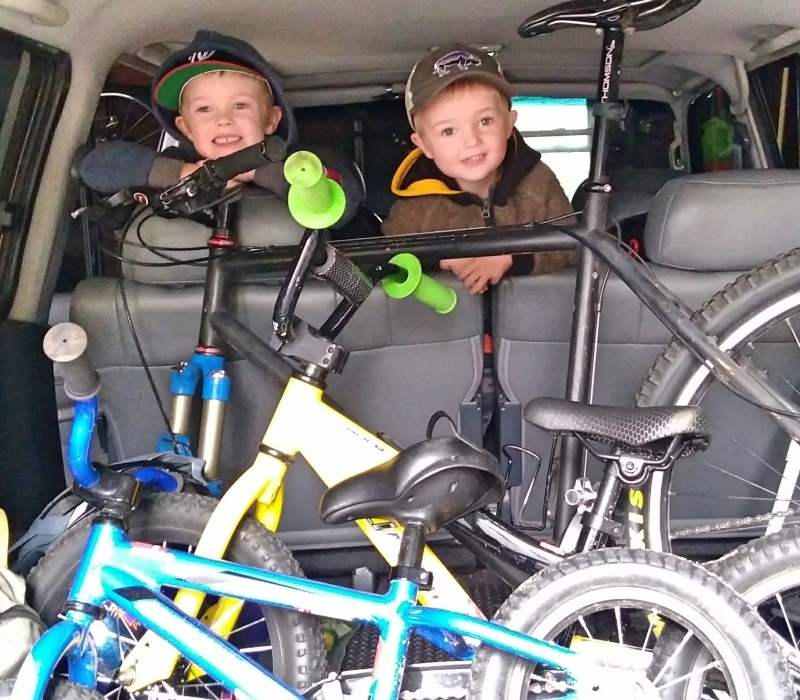 Thankfully, after taking my youngest to the park and being amazed at what he could do at the skatepark, the grandparents wanted to help take the boys’ bmx interests to the next level. A few weeks ago, spending close to $300 for a kids bike would have also seemed insane. 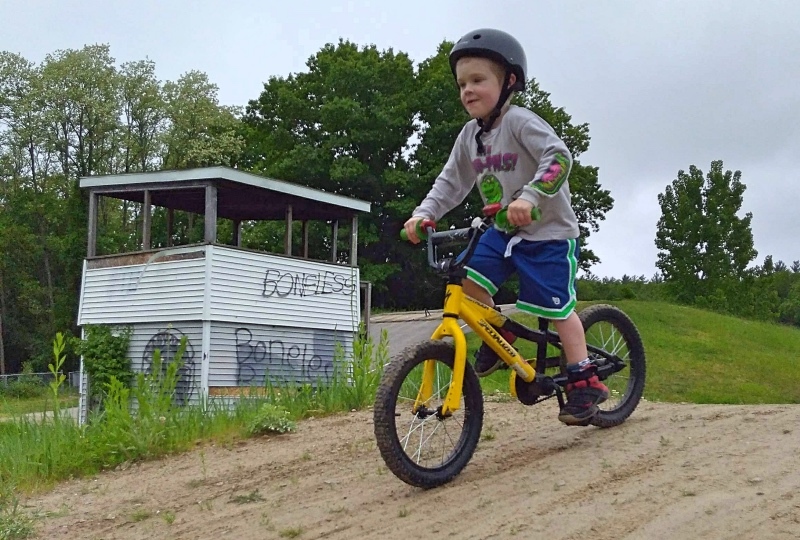 After visiting several bike shops though, $300 bought a great deal less kid bike than I would have expected, with even the little 12″ Specialized with training wheels being $190. Having experienced the challenge in finding these bmx-specific bikes, I also felt confident that if the whole BMX fascination faded and I needed to sell them, I probably could for the same price I bought them for. For reference, one can buy a Redline Micro for about $500 on amazon (out of stock). Where are we going from here? I’m not sure. 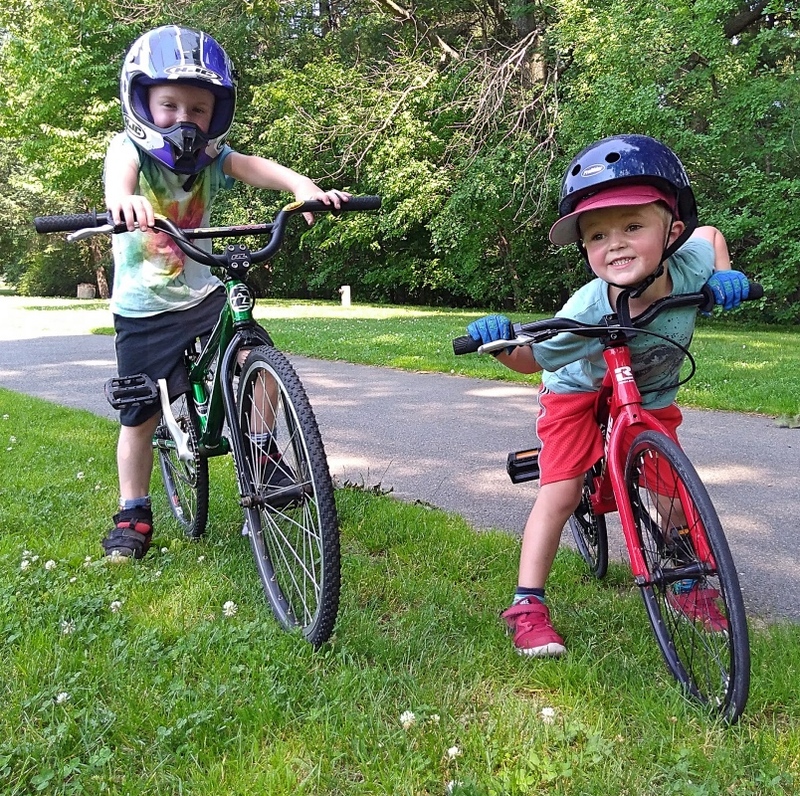 After our first visit to the park with the new bikes, my new rule is that they must wear their full-face helmets when they ride their bmx bikes… I know they will hit the ground eventually and they are must faster riders now. I would also like to take the boys to the track on an off-day so they can just ride the whoops and have fun with the competition aspect. Will that race-day ever happen? I’m not sure. If we do, I want that enthusiasm to come from them and not me. Until then, we’ll be out there exploring one pedal revolution at a time. lee: You are very welcome! lee: (smiling) Glad you liked it!